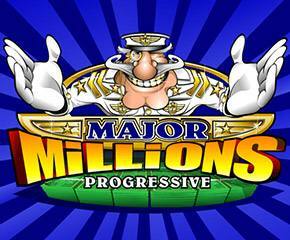 Major Millions slots is a big name in the online casino world. Brought by Microgaming in the year 2000, this slot is shining in the market since then and many slot players crave the fun and simplicity in its features. This is a 5-reel slot which can be played for 15 paylines. The name of the slot is perfectly chosen to remind the players the winnings the players can possibly get from this slot. The slot features a cool and exciting military theme. The symbols include fighter jets, tanks, medals, battleships, major’s hat, a secret letter, a case of ammunition, field binoculars and submarines along with the cherries and sevens. The sound effects of the military band marching in the background only adds to the excitement of the game. The wild – Major Millions logo and the scatter symbol – a graphic explosion add the real spark into the game. The scatters unlock the bonus features and multipliers for you and the chances of winning and the payouts the game offers, will have you a bit heady. As one of the first games by Microgaming, the slot does not feature any separate bonus features. But the wilds and the scatters of the game fill up that part with helping you win the multipliers and some cash prizes. 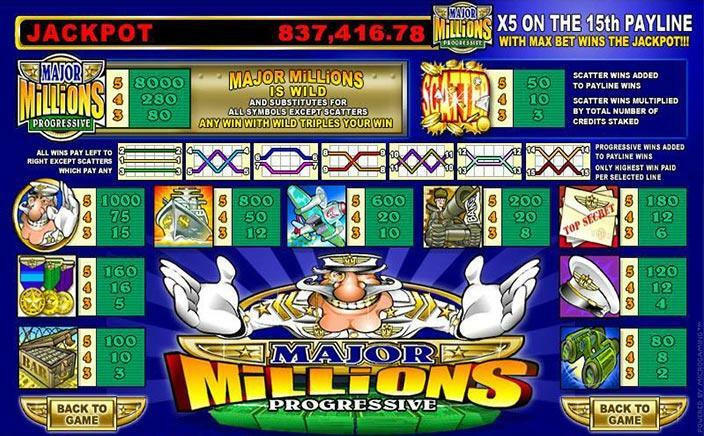 The Major Millions logo acts as the wild of the slot and it unlocks the multiplier. If you get 2 of these wilds on the reels, your winnings are multiplied by 4. The average win you can get from the slot is 40 times your bet. The main attraction of the slot is the progressive jackpot. To win the jackpot you need to land 3 wild symbols on the reel 3 of the slot. Microgaming has linked all the online casinos and the slots to the casino partners. So every time a player misses the jackpot, the amount gets even bigger. Major Millions is a decent game when it comes to entertainment. The military theme it features is really simple. But the payouts you can get through the bonus features like wilds and multipliers are simply amazing. And if you reach the progressive jackpot, there’s a chance you win a big amount in this slot.